It’s time to bid farewell to my favorite time of the year – #CephalopodWeek. For 7 days, scientists and cephalopod enthusiasts honor our smart, inky, tentacle waving friends. Love ocean stories? Check out more popular Krystian Science underwater posts. Explore ocean photography, news, and exciting discoveries. You can also follow me on FACEBOOK, TWITTER and INSTAGRAM! The first operational dive of Okeanos Explorer’s 2016 season got off to a frightful start. At the end of February, NOAA’s remotely operated vehicle (ROV) Deep Discoverer dove 2 1/2 miles underwater to collect geological samples near Hawaii. While surveying the area, scientists were shocked to see a wispy white ghost-like octopod dance into view. The appearance of this animal was unlike any published records and was the deepest observation ever for this type of cephalopod. This ghostlike octopod is almost certainly an undescribed species and may not belong to any described genus. Image courtesy of NOAA Office of Ocean Exploration and Research, Hohonu Moana 2016. The haunting image below captures the moment the unique cephalopod appeared from the deep. Scientist believe it is almost certainly an undescribed species and may not belong to any described genus. Image courtesy of the NOAA Office of Ocean Exploration and Research, Hohonu Moana 2016. This adorable seven-inch, deep sea octopus is a species rarely seen by humans. In fact, very little is known about the life history of these animals. They are small, fragile, and gelatinous, with relatively large eyes. The funny thing is they don’t have a name yet! Stephanie Bush, a postdoctoral fellow at the Monterey Bay Aquarium Research Institute (MBARI), is researching this cartoony creature and has the difficult task of finding it an appropriate name. Until they know what to formally call it, researchers are simply referring to it as the “flapjack octopus,” which belongs with its cousins in the Opisthoteuthis family. “I was thinking about what my options are [for naming it], and I wanted it to be something indicative of the characteristic of the species. Since they’re so cute, I thought I could name it the Opistoteuthis adorabilis,” Bush told ABC News. They have a well defined web just under their tentacles that allows them to parachute around the water. The fins above their eyes helps them steer! In their exhibit at the Monterey Bay Aquarium, these un-described cephalopods live in a tank specially designed to imitate the cold, low-oxygen environment of their deep-sea habitat. The image below shows the flapjack octopus (Opisthoteuthis sp.) on exhibit. 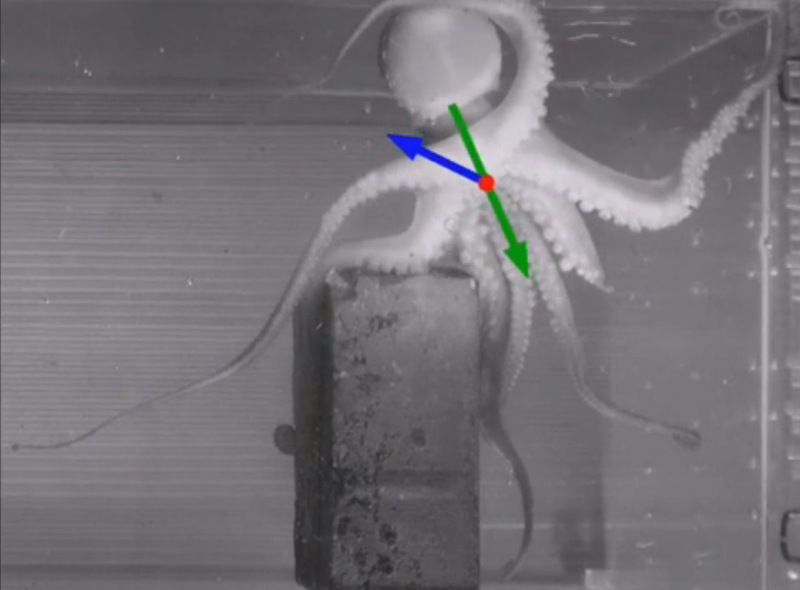 Researchers use a red light to display this species because the octopus can’t see red light. This makes it think it’s safe in the darkness of the deep sea, just like its natural habitat. Bush and her MBARI team collected about 15 specimens last year using a remotely-operated vehicle along Monterey Canyon in the eastern Pacific. Those little guys now live at the Monterey Bay Aquarium.